Boost your fan experience via Snapchat Context Cards. 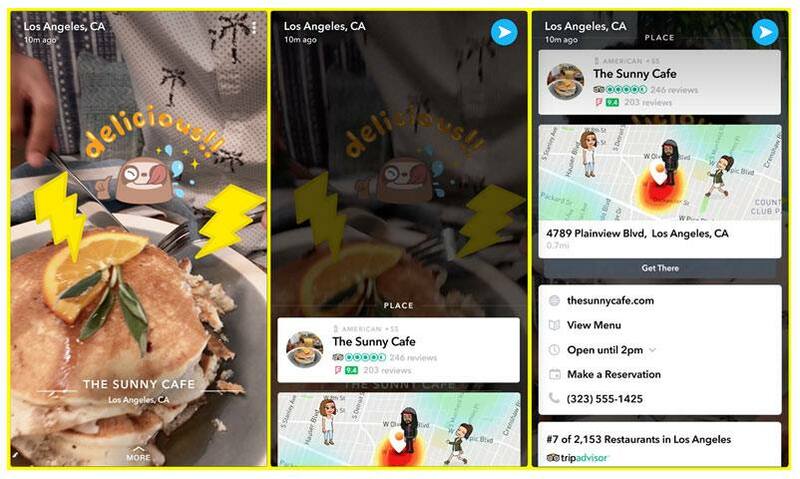 Based on generalized geotagging, Snapchat recently developed services such as Snap Map, which lets users view a location on a map, or geofilters to share a precise location on a Snap. Context Cards now let users get a range of information about where their friends are without having to leave the app. By forging key partnerships with players such as TripAdvisor, Foursquare, Uber and Google Maps, Snapchat gives you the ability to find out about opening hours or products available in a store. For restaurants, you can see reviews and ratings, see when they’re open, book a table or order your Uber to get there. This new functionality is beneficial for users, but it is also a major asset for professionals. Through a simple photo, a consumer makes you visible to hundreds of contacts, who are just a swipe away from finding out more about your venue and related information. In addition to restaurants and retailers, Context Cards can also be used to share information about public events. Snaps or Stories are already used for these types of events because they are entirely suited to the exclusive and temporary nature of the event business. Access to Context Cards is easy: during a Snap with geotagging, simply swipe up to show the card. The Snap Card appears and lets you indicate the venue location, telephone number, hours, reviews and transport options for getting there. Although only available in certain countries for the time being, Context Cards should be arriving in France soon. Snapchat has also announced that new companies will soon be added to the list of partners to expand the tool’s capacities.